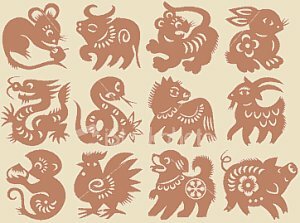 Twelve Animals of the Chinese Zodiac System. sexagenary (60-year) cycle. Details below. Chinese paper-cuts (Jp. = Senshi 剪紙). The Chinese Zodiac is part of an elaborate and laborious system based on Chinese astrology, cosmology, and divination. It was calibrated to track the waxing and waning phases of the moon, used as a method for counting years, months, days and hours in the Chinese imperial court and civil calendar, and utilized to forecast one’s future and determine one’s character. Although replaced in modern times by the Gregorian (solar) calendar, the Zodiac is still used today (unofficially) as a popular method of divination in many Asian and Western nations. The Chinese Zodiac is the preeminent calendar of old-world Asia. Its 60-year (sexagenary) cycle is still of crucial importance to modern art historians, for it helps them pinpoint the date of artwork made in earlier times. 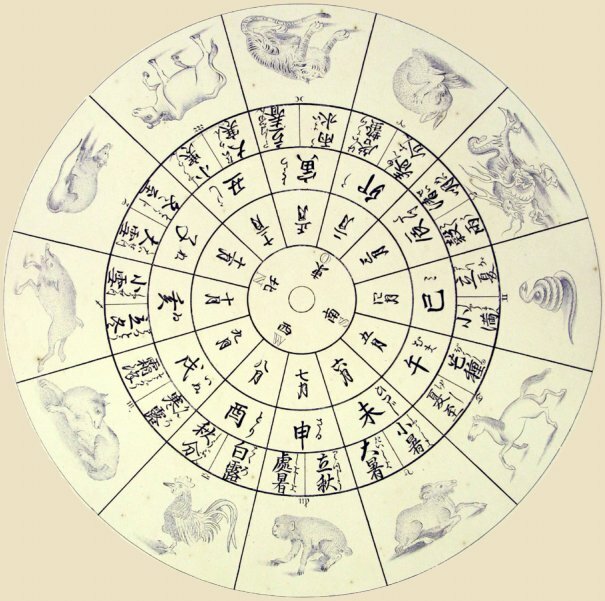 Although the Chinese Zodiac is based on a 60-year cycle, most folks only know about the 12-year cycle associated with 12 Zodiac animals. The Chinese Zodiac differs in many crucial respects from the Western Zodiac, and the two should not be confused. The former is based on a lunar year and five 12-year sub-cycles, while the latter revolves around a 12-month solar year. The Chinese zodiac, moreover, is not equated with constellations, as is the occidental zodiac. However, Chinese astrology does in fact incorporate numerous concepts from the Hellenistic zodiac and from Indo-Iranian astrology, including the Nine Luminaries & the 28 Lunar Mansions. Most scholars believe the Chinese Zodiac originated well before the Historical Buddha’s birth in India (who was born around 500 BC). In China, the earliest depictions of the 12 Zodiac animals appear in tomb-ceiling paintings dated to 533 BC <source: NY Metropolitan Museum of Art>. China’s Zodiac system grew more elaborate and complex over the centuries, but its importance in China ensured its acceptance elsewhere, and thus it greatly influenced and colored the subsequent development of Buddhist traditions throughout Asia. In China, where Buddhism was introduced in the 1st & 2nd centuries AD, the 12 Zodiac animals became associated with Buddhism’s 12 Heavenly Generals as early as the Sui Dynasty (581-618). When Buddhism arrived in Japan in the mid-6th century AD, the Japanese eagerly imported both the Buddhist teachings and the Zodiac calendar -- the calendar was officially adopted in 604 AD. 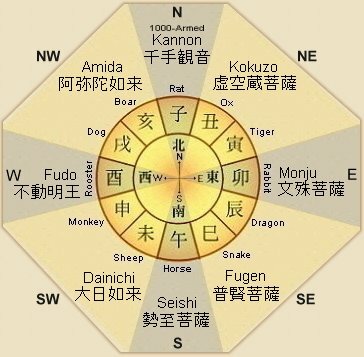 In Japan, the Zodiac calendar is known as Kanshi 干支 (also read Eto), and the 12 animals of the Zodiac are known as the Jūni Shi (Juni Shi) 十二支. The Zodiac’s popularity in Japan peaked during the Edo Era (1600-1868 AD), by which time each of the 12 animals were commonly associated with one of eight Buddhist patron protector deities (four guarding the four cardinal directions and four guarding the four semi-directions; the latter four are each associated with two animals, thus covering all 12 animals). At many Japanese temples even today, visitors can purchase small protective amulets or carvings of their patron Buddhist-Zodiac deity. In Japan, the lunar calendar was abandoned in 1872 in favor of the solar (Gregorian) calendar, but even today many temples and shrines continue to use the lunar calendar for important festivals and events. For details, see Zodiac Lunar Trivia in Japan below. CAVEAT: There is approximately a one-month disparity between the lunar and solar calendars, so one’s Zodiac sign may differ from that shown above for people born in January or February. For example, say you were born on 19 Jan. 1987. Your sign is not the HARE (as shown above), but rather the TIGER. Why? Because the lunar year back then began on 9 Feb. 1986 and ended on 29 Jan. 1987. People born on Jan. 30 (1987) or thereafter are HARE folk, but people born between Jan. 1 and Jan. 29 (1987) are TIGERS. To determine your exact animal sign and Buddhist patron based on the Chinese lunar calendar, see below lunar chart. Alternatively please click here. To learn more about the lunar vs. solar calendar, click here. NOTE: In addition to the Eight Buddhist Deities and 12 Zodiac Animals shown above, there are Zodiac traditions involving other popular Japanese deities. In the list below, we show the Ennichi 縁日 (literally "related day" or "day of connection" and translated as “holy day”) for other deities. Ennichi are thus days with special significance to one particular deity. Saying prayers to this deity on this day is believed to bring greater merits and results than on regular days. The situation is actually much more complicated. For example, a very auspicious day is the day of the snake in the month of the snake in the year of the snake. Indeed, the founder of the Kamakura Shōgunate -- Minamoto Yoritomo 源頼朝 (1147-1199) -- had a dream in the 12th century on exactly this day, and ordered the construction of a shrine dedicated to the Goddess Benzaiten (who is intimately associated with snakes). The shrine is the still-popular Zeniarai Benzaiten Shrine 銭洗弁財天宇賀福神社 in Kamakura, which is especially popular and reportedly most effective for worshippers on snake days. Nonetheless, not all snake days are auspicious. Some days, like the snake day of the twelve month in the old lunar calendar, are considered unlucky. On this particular day, people were advised not to work the fields or get married. Such bad-luck days, and there are many, are called Kannichi 坎日 in Japanese. For listings by year from 1924 to 2043, please click here. NOTE: In the directions column, NE (U) denotes the upper northeast direction, while NE (L) denotes the lower northeast direction. Same system for the other semi-directions. 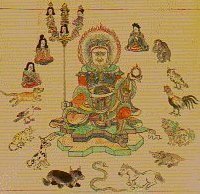 It was probably in Japan’s Edo Period (1603 - 1867 AD) when the 12 zodiac animals were each associated with one specific patron Buddhist deity, the Eight Buddhist Patron Protector Deities. I’m not sure when this system was actually adopted, but the eight include four guarding the four cardinal directions and four guarding the four semi-directions. The grouping likely originated in China. Why not assign 12 patron deities instead of eight? 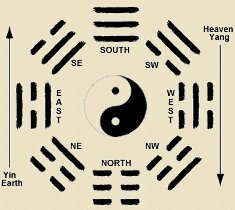 The most plausible reason involves Chinese Taoism, Feng Shui 風水 (geomancy), and divination, for there are eight interrelated symbols (or trigrams) in Chinese cosmology called the Bā Guà (Chn. = 八卦, Jp. = Hakka). Each consists of three lines and each is associated with either the yin or yang principle. The eight trigrams symbolize the unceasingly changing balance of forces and are used in divination. For details, see Divination below. As reproduced by Philipp Franz von Siebold. The lunar calendar (zodiac calendar) is based on the waxing and waning of the moon. There are 29 to 30 days per lunar month, with approximately a one-month disparity between the lunar and solar calendars. In Japan, the lunar calendar was abandoned in 1872 in favor of the solar, but even today many temples and shrines continue to use lunar dating for important festivals and events. In the lunar calendar, the new moon (1st of the month), the half-moon of the first quarter (7th or 8th), the full moon (15th), and the half-moon of the last-quarter (22nd or 23rd), are considered sacred days and known as Hare-no-hi 晴れの日. All other days of the months are known as Ke-no-hi 褻の日. Until modern times, Japan’s most important festivals were almost always held on Hare-no-hi days. 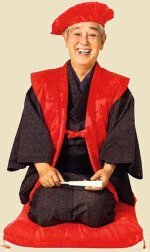 People in former times believed the day began and ended from sunset to sunset, so festivals were normally held from the eve of the festival (yoi matsuri 宵祭り) into the daylight hours of the main festival day (hon matsuri 本祭り) -- with festivities ending at sunset on the main festival day. Thus, Hare-no-hi festivals typically lasted only 24 hours, from sunset to sunset. One month is added to the lunar calendar. For example, if a festival occurred on May 1st in the lunar calendar, it will occur on June 1st using the solar calendar. The lunar calendar is still used to calculate the equivalent solar date. If the festival occurred on May 1st in the lunar calendar, it will be held on/about June 1 in the solar calendar. No change. If the festival occurred on May 1 in the lunar calendar, it will occur on May 1 in the solar calendar. In private collection of US collector. Is the Asian Zodiac Based on Constellations? The Asian zodiac is not based on constellations, as is the Western (Greek/Roman) zodiac. The Asian calendar is based on the twelve yearly phases of the moon, known as the twelve-month lunar year (each month lasting between 28 to 31 days). The Western (Greek/Roman) calendar is based on the annual path of the sun through twelve star constellations, known as the solar year. 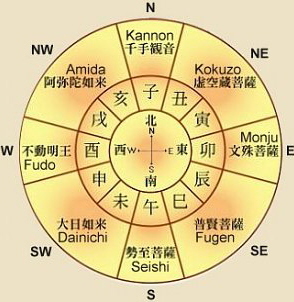 East Asia’s calendar is also based on the Twenty-Eight Constellations or 28 Moon Lodges, which added greater precision. Toshi Otoko 年男 and Toshi Onna 年女. The “partial” Zodiac is based on a 12-year cycle, each year associated with a particular Zodiac animal. Every 12 years, the Zodiac sign under which one is born comes around again. When this occurs, that is, when one’s Zodiac sign is the same as the current year, men are called Toshi Otoko and women are called Toshi Onna. Kanreki 還暦, or 60th Birthday Celebration. The “full” Zodiac is based on a 60-year cycle (five 12-year sub-cycles). When one reaches sixty years of age, the 60th birthday is called kanreki -- the recognition of one’s “second infancy.” The Japanese term kanreki 還暦 literally means “return 還” and “calendar 暦.” Phrased differently, the cycle of life returns to its starting point after 60 years, and as such, kanreki celebrates that point in a one’s life when one’s personal calendar has returned to the calendar sign under which one was born. Friends and relatives are traditionally invited for a celebratory feast on one’s 60th birthday, and it is customary for the celebrant to wear a red hood and red vest. These clothes are usually worn by babies and thus symbolize the celebrant’s return to his/her birth. 1. First month, first day = Kochōhai 小朝拝, New Year Celebration. 2. Third month, third day = Kyokusui no en 曲水の宴, Drinking Around a Rolling Stream. 3. Fifth month, fifth day = Tango no sekku 端午の節句 or Boys' Festival. 4. Seventh month, seventh day = Kikkouden 乞功奠 or Tanabata 七夕 Festival. 5. Ninth month, ninth day = Chōyō no en 重陽の宴 or Feast of Chrysanthemuns. TEN STEMS or TEN HEAVENLY STEMS. The ten stems are a cyclic numeric system that date back to China’s Shang Dynasty (1600 - 1046 BC). They correspond to the ten days of the ten-day week used by Shang rulers (these days relate to ten suns that appeared in a ten-day cycle in ancient Chinese mythology). The stem names also appear in the names given the early Shang kings. The ten are combined with the 12 zodiac animals (the “12 Branches,” see below) to form 60 two-symbol units. Each unit represents a year in the Zodiac calendar, and the 60-year cycle is known as the sexagenary cycle. The cycle was repeated ad infinitum for counting years in China. In Japan, the sexagenary system was adopted in 604 AD by Empress Suiko, and is known as Jikkan Jūnishi 十干十二支 (literally “10 stems and 12 branches”). The current 60-year cycle started in 1984. Alternate readings (names) for the ten stems were derived by combining the Five Elements with yin-yang dualism, yielding ten “alternate” combinations. For a complete listing of the 10 stems and 12 branches, see lunar charts below. Each of the 12 is also associated with hours in the day, months of the year, compass direction, others. NOTE 1: In the directions column, NE (U) denotes the upper northeast direction, while NE (L) denotes the lower northeast direction. Same system for the other semi-directions. NOTE 2: In Buddhism, the dragon and snake are both members of the Naga family of serpentine creatures; originated in Hindu mythology. Each Zodiac animal represents one year in a 12-year cycle, a day in a twelve-day cycle, a two-hour period in each day, and a compass direction. The day, for example, starts at twelve midnight, and corresponds to the Rat. Every two hours, it moves to the next zodiac animal, with twelve noon associated with the Horse. When it comes to compass directions, the Rat signifies due north, and every 30 degrees clockwise it moves to the next zodiac animal. 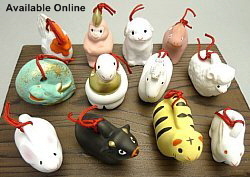 Temples and shrines perform many of their services and festivals on specific zodiac animal days. For example, Inari shrines hold their annual festivals on the first horse day in February, while Benzaiten shrines hold their yearly festival on the first Snake day in February. Inari shrines are dedicated to Oinari (food/fox deity), while Benzaiten shrines are devoted to the water goddess Benzaiten, who is closely associated with both the snake and dragon. The five elements 五行 (Jp = Gogyō, Ch = Wǔxíng) are wood, fire, earth, metal, and water. The five were combined with the binary Yin-Yang system -- Yin 陰 (Jp = in) and Yang 陽 (Jp = yō) -- resulting in ten “alternative” readings for the ten stems. See below chart for these alternative readings. In the 60-year cycle, odd years were classified as YANG years, even years as YIN. Even today, when the 60-year cycle reaches completion, some people in Japan who are 60-years of age hold a special birthday ceremony called kanreki 還暦. Additionally, Chinese ideas of illness, especially Taoist notions of illness as caused by imbalances of yin and yang forces in the body, were introduced to Japan probably by the late Nara or early Heian periods. Taoist notions embodied various concepts of the Zodiac calendar. Click here for an example of Taoist traditions based on the Zodiac calendar. The five major planets were associated with the Five Elements. NOTE: In Chinese astrology, one's destiny is determined by numerous factors, including the position of the major planets, the sun and moon, and comets at the time of one’s birth, along with the time of one’s birth and other influences. Yin 陰 (Jp = in). Feminine, passive, negative, etc. Yang 陽 (Jp: you) Male, aggressive, positive, etc. The ten stems were given alternate names by combining the binary yin-yang principle to each of the five elements. The yang "e" 兄 (elder) and yin "to" 弟 (younger) were joined with each element, resulting in ten possible combinations. The five-elements theory in following centuries was combined in various groupings with the Guardian Spirits of the Four Cardinal Points. The combinations differ by cult and country, and often involve the primary colors, parts of the body, seasons of the year, and other attributes. Five-Elements in Esoteric Buddhism. Elsewhere, in Japan, there is another five-element Buddhist concept related to five-tier pagodas and stupas, with a somewhat different set of five elements. Each piece in the five-story pagoda (Sanskrit = stupa) corresponds to one of five elements in the traditions of Esoteric Buddhism (Shingon and Tendai sects). The bottom story is square and corresponds to the earth ring (Japanese = Chirin 地輪). Next is the spherical water ring (Japanese = Suirin 水輪), surmounted by the triangular ring of fire (Japanese = Karin 火輪). Above this is a reclining half-moon shape (Japanese = Fuurin 風輪), representing the wind, and topmost is the gem-shaped ring of space (Japanese = Kuurin 空輪). Click here for details. The number five holds tremendous significance in nearly all Buddhist traditions. Click here for a review of key concepts related to the number five. The binary Yin-Yang system is nearly as old as China itself. It is the central pillar of all Chinese systems of divination, and a key element in Chinese philosophy. In the Chinese Book of Changes (I Ching 易經), the yang principle is represented by a straight line _____ and the yin principle by a broken line __ __. The two are combined into abstract line arrangements (hexagrams and trigrams) with various meanings. Certain combinations are auspicious, others inauspicious. Different methods are used to "cast" a reading. These trigrams, over time, were developed into a complex system composed of 64 hexagrams 六十四卦. The trigrams number eight, and in Chinese cosmology are called the Bā Guà (Chn. = 八卦, Jp. = Hakka). Each consists of three lines and each is associated with either the yin or yang principle, and related in various ways to the Five Elements. The eight trigrams symbolize the unceasingly changing balance of forces and are used in divination. They appear in two different versions -- the “Earlier Heaven” arrangement used for burial sites and the “Later Heaven” arrangement used for residences. They were also combined with the Zodiac system (this combination is not discussed herein, but photos are shown below). 10 Stems, 12 Branches (Animals), Yin-Yang, Five Elements, Months, Directions, Hours. Buddhist Patron Listed Below Animal Sign. Dates in Year / Month / Day Format. NOTES: Dates from 1984 to 2043 in Year / Month / Day Format. In above chart, the 57th year is known as KŌSHIN. 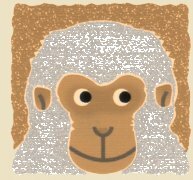 It is a Monkey Year of great misfortune. The next Kōshin year occurs in 2040 AD. Details here. The 60-year (sexagenary) cycle gets more complicated when the alternate ten stems (derived by combining the five elements & yin-yang dualism) are used. In this latter system, six of the animals are associated with the "yang" element and six with the "yin" element -- they are either yang or yin, but never both. Details here. The above chart includes the yang-yin associations. In the directions row, NE (U) denotes the upper northeast direction, while NE (L) denotes the lower northeast direction. Same system for the other semi-directions. Finally, the Chinese have yet another Zodiac calendar, the agricultural calendar (not discussed herein), which approximates to the lunar calendar, but not exactly. BE CAREFUL USING THIS CHART. Here is one example: Say you were born on Jan. 19, 1987. Your sign is thus the TIGER, not the HARE. If you review the above chart, you will see that everyone born between 1986 (Feb. 9) and 1987 (Jan. 29) falls into the TIGER category. Even though you were born in the year of the HARE (1987), you are still a TIGER based on the lunar calendar. Therefore, be careful using this chart. If you are still unsure, please click here. NOTES: Dates from 1924 to 1983 in Year / Month / Day Format. In above chart, the 57th year is known as KŌSHIN. It is a Monkey Year of great misfortune. The next Kōshin year occurs in 2040 AD. Details here. The 60-year (sexagenary) cycle gets more complicated when the alternate ten stems (derived by combining the five elements & yin-yang dualism) are used. In this latter system, six of the animals are associated with the "yang" element and six with the "yin" element -- they are either yang or yin, but never both. Details here. The above chart includes the yang-yin associations. In the directions row, NE (U) denotes the upper northeast direction, while NE (L) denotes the lower northeast direction. Same system for the other semi-directions. For dates prior to 1924, please click here. Finally, the Chinese had yet another Zodiac calendar, the agricultural calendar (not discussed herein), which approximates to the lunar calendar, but not exactly. BE CAREFUL USING THIS CHART. Here is one example: Say you were born on Jan. 28, 1964. Your sign is thus the HARE, not the DRAGON. If you review the above chart, you will see that everyone born between 1963 (Jan. 25) and 1964 (Feb. 13) falls into the RABBIT category. Even though you were born in the year of the Dragon (1964), you are still a RABBIT based on the lunar calendar. Therefore, be careful using this chart. If you are still unsure, please click here. In the Zodiac, yin-yang dualism is combined with the five elements to obtain ten “alternate” readings for the ten stems (see above). In the 60-year cycle of the Zodiac calendar, days and years are further divided into those of great fortune and misfortune, mediocre luck or misfortune, and neutral luck or misfortune. For example, certain Zodiac days of great misfortune in Japan are known as Kōshin days 庚申 (Ch: keng-shen or geng-shen). They occur six times yearly, and once every 60 years, and special rites -- influenced greatly by Chinese Taoist and Zodiac beliefs -- are performed on these days to ward off evil influences. One of the main players is the monkey, for the term Kōshin 庚申 is comprised of two characters -- Kō 庚, the stem associated with metal and the planet Venus, and Shin 申, the ninth symbol of the Chinese zodiac and the character for “monkey.” In Taoist traditions based on the Zodiac calendar, on the eve of a Kōshin Day, three worms (三蟲) believed to dwell in the human body escape from the body and visit the Court of Heaven to report on the sleeping person's sins. Depending on this report, the court might shorten that individual's life. To prevent this, people stayed awake all night on the eve of a Kōshin day, and this practice eventually became known as the Kōshin Machi (Kōshin Vigil, Kōshin Wake, 庚申會). In Japan, such beliefs were recorded by the late Heian era, but became particularly widespread during Japan's Edo period (1600-1868 AD), when people regularly tried to determine auspicious or inauspicious times before beginning activities (such as a new business or marriage). See the Monkey Pages for many more details. Bad luck ages are referred to as yakudoshi, with yaku meaning “calamity” or “calamitous” and doshi signifying “year(s).” These years are considered critical or dangerous because they are believed to bring bad luck or disaster. For men, the ages 24 and 41 in China (or 25 and 42 in Japan) are deemed critical years, with 41 being especially critical. It is customary in these unlucky years to visit temples and shrines to provide divine protection from harm. The birthday person should wear red to bring good health, vitality and long life. The equivalent yakudoshi ages for women are 18 and 32 (19 and 33 in Japan), with 32 thought to be a particularly hard, terrible or disastrous year. Like the age 41 for men, precautions are taken to ward off bad luck. In China, from the Sui Dynasty (581-618 AD) onward, Buddhist images of the 12 Heavenly Generals of Yakushi Buddha were associated with the twelve Zodiac animals. But in Japan, this association between the 12 Generals and the 12 animals does not emerge until the Kamakura Period (1185 - 1333 AD), after which the astrological animals often appear in the head pieces of the 12 Generals. See M. W. de Visser's charts relating the Twelve Yaksa to zodiac signs in “Ancient Buddhism in Japan, Vol. II” (Leiden: 1935, pp. 551-553). 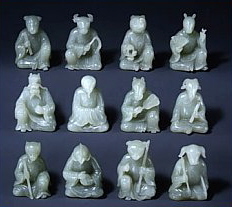 Much later, probably in the Edo Period (1603 - 1867), the 12 animals were each associated with one specific patron Buddhist deity, the Eight Buddhist Protector Deities. I’m not exactly sure when this latter system was adopted, but the eight include four guarding the four cardinal directions and four guarding the four semi-directions. It likely originated much earlier in China, but I’ve been unable to confirm this. Poetry Contest, Zodiac Emaki (Hand Scroll), Edo Period. Photo: Kyoto Nat’l Museum. 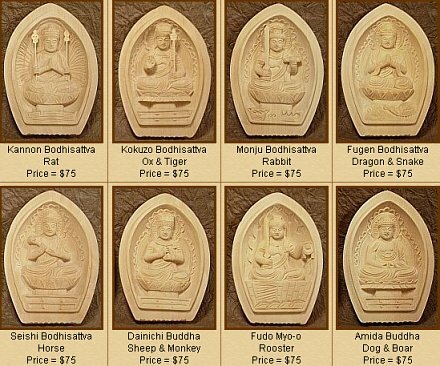 Eight Buddhist Protectors of the Zodiac (this site). Yowatashi Boshi; Stars that Pass in the Night. Japan's Cultural Heritage Reflected in the Star Lore of Orion. By Steve Renshaw and Saori Ihara. Horie Yasutaka (Modern Buddhist Artist). 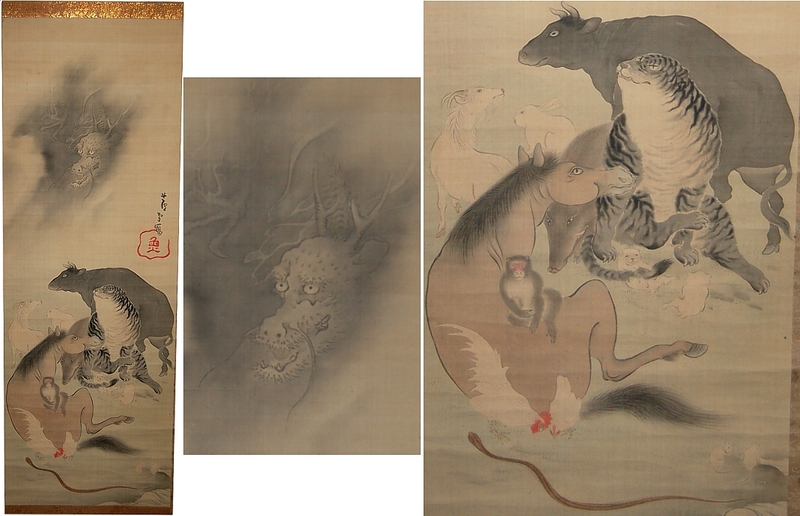 Paintings of the Eight Protectors. The Worship of Stars in Japanese Religious Practice. Edited by Lucia Dolce. Special double issue of Culture and Cosmos. ISSN 1368-6534. Useful publication with many illustrations.